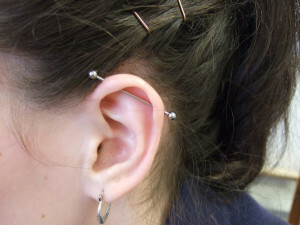 What is an Industrial Piercing? Industrial piercing is referred to those kind of piercings in which two holes are connected with the help of a straight jewellery piece. However, the term generally refers to the double hole made on the upper part of the ear cartilage. One perforation is made close to head while the other is made a little lower on the cartilage. The straight jewellery piece is then inserted which travels diagonally from one perforation to the other. 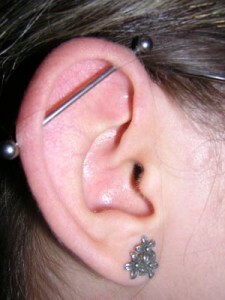 Industrial piercing can also be carried out vertically and horizontally. If the piercing is carried out in a proper way, it creates an attractive eye-catchy look. How is Industrial Piercing Done? Industrial piercing which is also known by the name of scaffold piercing usually involves the perforation of 2 holes on the upper part of the ear cartilage. As this kind of ear piercing involves perforation of 2 holes, sometimes the process gets a bit painful. It is essential to get the piercing done by an experienced and reputed piercer. The piercer sets up all the required items like needles, cottons, antiseptics, jewellery, etc. The piercer puts on gloves after washing hands and disinfects the ear. The needle point is marked on the ear and a line is drawn indicating the alignment of the jewellery. The hollow needle is pushed by the piercer creating the 1st hole. After inserting jewellery through this hole, the piercer pushes the needle to make the 2nd hole and inserts other end of the jewellery. The blood is cleaned up and disinfectant is once again applied to the pierced area. 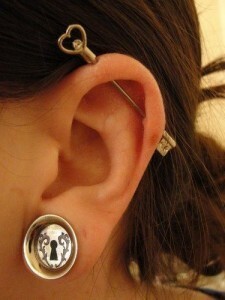 Industrial piercing includes connecting 2 pierced holes with the help of some straight jewellery piece. 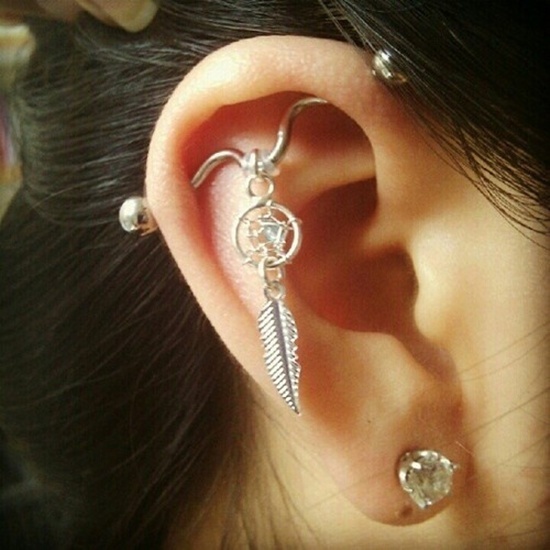 Industrial piercing is generally carried out on the upper part of the ear cartilage with one perforation close to head and the other perforation slightly towards the lower part of cartilage. There is no doubt that every piercing hurts. But, the intensity of the pain definitely depends on how a person handles pain. Those who have the stamina to bear pain to a great extent usually do not face much of trouble. The amount of pain also depends on whether the ear piercings are horizontal or vertical. Getting the ear pierced feels more like a pinch and usually does not hurt much. The actual pain comes during the healing and cleaning process. 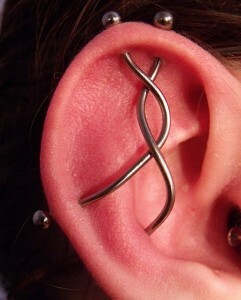 Piercers often instruct to twist jewellery during the time of cleaning which is extremely painful and hurts a lot. 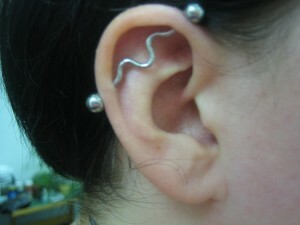 But, twisting ensures that the cleanser goes through the piercing and healing it from within. 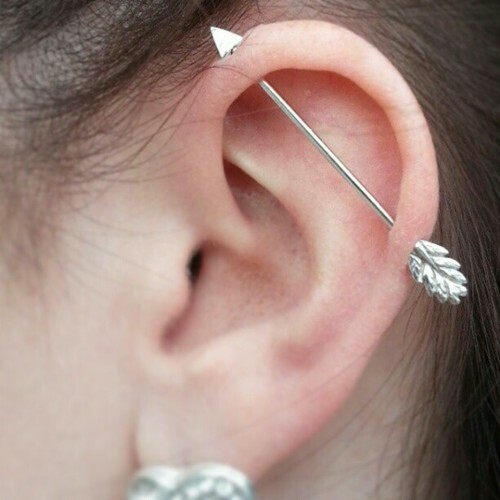 Thus, it can be said that Industrial piercing would hurt a bit, but it is the anticipation before the time of piercing that hurts the most. The upper part of the ear cartilage is a sensitive area and piercing it will cause bleeding to some extent. If the piercing is not carried out in a professional manner, chances are that the blood vessels might get cut. It is always a good idea to avoid cleaning the clots from the piercing and let them stay for a minimum of twenty four hours. The piercing can then be washed with water which will clean away the clots and not cause any irritation. The bleeding generally tends to ease within twenty four to forty eight hours. Proper precautions should be taken to ensure that piercing does not get caught in towels or clothes which can lead to bleeding. Sleeping on the side of the piercing should be avoided for at least a few weeks. The presence of such symptoms clearly indicates that the punctured area is infected. Proper after care is necessary to heal the punctured area and get rid of the infection. Pierced area can be cleaned twice daily with saline solution prepared with half teaspoon of salt and one cup lukewarm water. Hydrogen peroxide and disinfectant soaps should be avoided to clean pierced area unless recommended by professionals. The pierced area should always be touched with clean hands to avoid further infection. The industrial piercing trend has been going on since ancient times. The huge popularity of this type of piercing has led to the evolvement of various jewelery types for the purpose. The most commonly used jewelery items are single barbells. But, thanks to technology, barbells of various types are available which ranges from loop barbells to zigzag stripe barbells. Apart from that, some other types which have gained huge popularity among industrial piercers include twister barbells, star ear barbells, diamond barbells and more. People have the option of choosing from a wide variety of shapes and sizes to suit their needs and preferences. Rejection can be defined as the cause while migration can be defined as the symptom. Rejection occurs naturally when any foreign object is introduced to the skin. The biggest challenge with rejections is that they are hard to notice. Rejection signs are quite similar to that of piercing infections and thorough observation is required to make out the difference. Dry red and scaly skin around pierced area is common rejection symptom along with colourless lymph discharge. Exit holes tend to be tender without any association of soreness. Elongation of exit holes is another common symptom associated with rejection. Industrial Piercing Precautions/ How to Stop It from Rejecting? If the industrial piercing has been carried out by an expert professional piercer then, chances of rejection are quite less. The person should make sure that the correct shape and size of jewellery is used for the piercing. 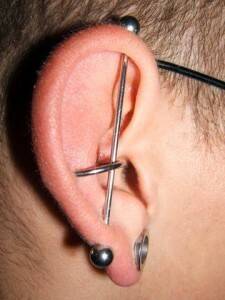 It is always a good idea not to put stress or add weights on the industrial piercing. The person should also make sure that he/she does not have any sensitivity or allergy towards the material of the jewellery. The piercing should always remain protected and clean from irritants which can cause infections or rejection. The piercer should be experienced enough to make sure that the piercing is carried out in a safe manner and avoid any tissue damage. How long does Industrial Piercing Last? Industrial piercings which are mostly carried out with on the upper part of the cartilage have higher chance of closing up completely as there is increased blood flow in the area. Industrial piercings can last as long as the body does not reject the jewellery and no infection is caused. However, when the jewellery is taken out, chances of the pierced hole closing up quite quickly are very high. The closing up can take a few days to a week depending on the body type of the person. 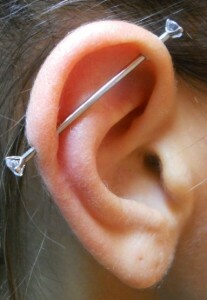 The prices for industrial piercing vary from one professional piercer to the other. It does not necessarily mean that higher the cost, the better is the piercing. There are lots of professionals who tend to add the after-care costs along with piercing price. 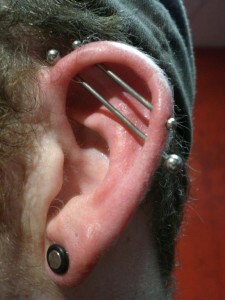 The body piercing shop, experience and reputation of the piercer as well as the choice of jewellery are some of the factors that affect prices for industrial piercing. 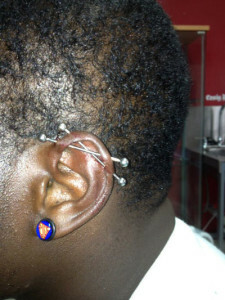 In general, prices for industrial piercing tend to vary from US$50 to US$70.